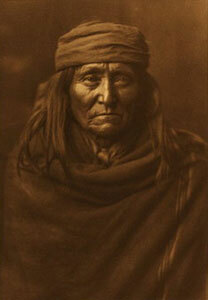 Edward Sheriff Curtis, Eskadi - Apache, Framed Photogravure, circa 1903, 17" x 12"
Edward S. Curtis is famous for his landmark publication, The North American Indian, which documented more than eighty Native American tribes in text and photographs. Curtis was born near Whitewater, Wisconsin, the son of a United Brethren minister. About 1874, the family moved to Le Sueur County, Minnesota where young Curtis became an avid outdoorsman. As a teenager, he also became interested in photography and built a camera using the book, Wilson's Photographics. In 1885, at age seventeen, he apprenticed with a photographer in St. Paul. Edward Sheriff Curtis, Counting the Record, Framed Photogravure, circa 1921, 18" x 22"
After the family moved to the Seattle, Washington area in 1887, Curtis bought a partnership in the photographic studio of Rasmus Rothi. He left that business after about six months and formed a new partnership with Thomas Guptill, called Curtis and Guptill, Photographers and Photoengravers. 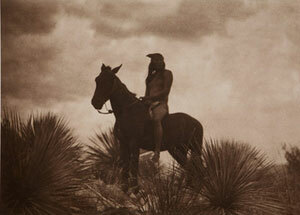 In 1897, Curtis and Guptill parted ways and Curtis renamed the studio Edward S. Curtis, Photographer and Photoengraver. In 1892, Curtis married Clara J. Phillips. They had four children: Harold (1893), Elizabeth, called "Beth" (1895), Florence (1899), and Katherine, called "Billy" (1909). Edward Sheriff Curtis, Arikara Chief, Photogravure 22" x 18"
In the mid-1890s, Curtis started photographing local Native Americans digging for shellfish in the tidal flats of Puget Sound. 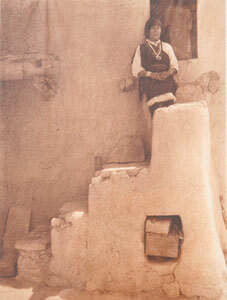 Three of these sepia-toned, soft-focus images won first prize at the National Photographic Convention in 1899. 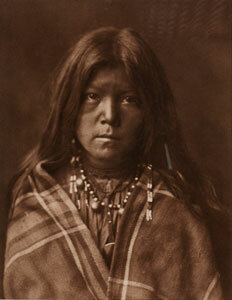 Curtis' first formal Indian portrait was of the aged Kickisomlo or "Princess Angeline," daughter of Suquamish chief Sealth after whom Seattle was named. 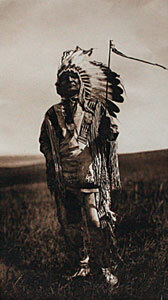 Curtis' interest in Native Americans intensified in 1899 when he was invited to be the official photographer of the Harriman Expedition to Alaska, and again in 1900 when he accompanied the eminent ethnographer, George Bird Grinnell, to view a Sun Dance encampment of Blackfoot and Blood Indians in Montana. Over the next few years he expanded his collection of Native photographs with travels to Hopi, Apache, Comanche and other Indian territories. 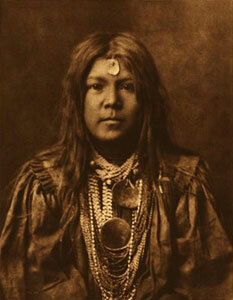 Edward Sheriff Curtis, Apache Nalin, Framed Photogavure, circa 1903, 17.5" x 13.5"
Curtis' early Native American images proved quite popular and he began to build a national reputation through the publication of articles illustrated with his photographs. Like most people of his day, Curtis believed that all Native tribes soon would be absorbed into European-American culture and disappear forever. Saddened by this recognition, he began to envision a monumental project to document all of the tribes west of the Mississippi while it still was possible. 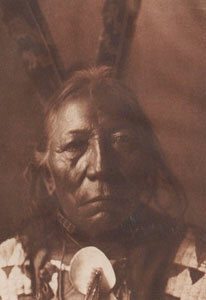 Edward Sheriff Curtis, Chideh - Apache, Framed Photogravure, circa 1903, 13.5" x 17.5"
In 1904, Curtis hired Adolph Muhr (who previously worked for Frank A. Rinehart making Indian portraits) to manage his darkroom and he began traveling regularly in pursuit of his grand ambition. Wanting the project to be meaningful scholarship as well a work of artistic merit, Curtis sought the advice of Frederick Webb Hodge and William Henry Holmes of the Smithsonian Institution's Bureau of American Ethnology. Hodge eventually became editor of The North American Indian, and he and Curtis remained life-long friends. Edward Sheriff Curtis, The Scout, Framed Photogravure, circa 1906, 13.75" x 17"
In 1906, Curtis asked the financier, J.P. Morgan, to underwrite the project. Curtis estimated that it would take five years to complete, and Morgan agreed to give him $15,000 per year for the five years to cover travel and photographic expenses. The two decided that The North American Indian would include twenty volumes of ethnographic text describing aspects of daily life such as food, tools, shelter, clothing, music, language, ceremonies, beliefs, and physical surroundings of the tribes, plus biographical sketches of tribal leaders. Each volume would be illustrated with 75 photogravures made from Curtis' glass-plate negatives, and each would be accompanied by an unbound portfolio of about 36 large photogravures. President Theodore Roosevelt agreed to write the forward (Curtis photographed the President's family a few years earlier and they had become friends.) 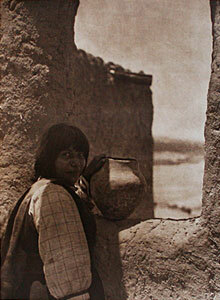 In return for his support, J.P. Morgan was to receive 25 sets of The North American Indian plus 500 original photographs. Publication would be funded by selling subscriptions for $3000 per set, with 500 sets to be printed. 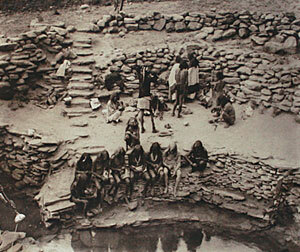 Edward Sheriff Curtis, Flute Dancers at Tureva Spring, Photogravure, 18" x 22"
Curtis threw himself into the project, traveling almost constantly while Muhr and other assistants operated the Seattle studio. Between trips to Indian reservations, Curtis gave illustrated lectures around the country and worked to publicize the project and sell subscriptions. The first volume appeared in 1907, and by this time Curtis realized the monumental effort would consume far more time and money than originally planned. In addition to the costs of photography and travel, the project required a large amount of field research and written documentation. To accomplish the myriad tasks, Curtis employed as many as seventeen assistants at one time. In 1909, Morgan pledged an extra $60,000 to the venture but even this amount could not cover expenses. Curtis made up the difference with lecture fees, subscriptions, and the sale of individual photographs. Nearly all profit from the successful Seattle studio went to support the project. 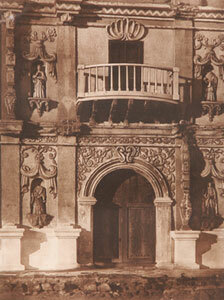 Edward Sheriff Curtis, Portal San Xavier del Bac, Plate Number 52, Framed Photogravure, circa 1907, 17" x 13"
Clara and the couple's three older children often accompanied Curtis on the early trips, but the family soon grew tired of the hard work and disruption of travel, often in remote places. Clara also became resentful that nearly all of the family's resources were devoted to the project. In 1916, she filed for divorce, and when it was granted three years later, she was awarded the studio and all of its contents. It is said that Curtis and his daughter Beth destroyed all of the studio negatives at that time. (Clara subsequently operated the studio for a number of years along with her sister Nellie and, later on, with her daughter Billy.) At the time of the divorce, Curtis had published only eleven of the 20 volumes. 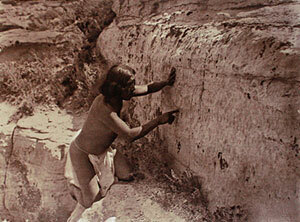 Broke, exhausted, and without a studio, he stopped work on The North American Indian in 1919. 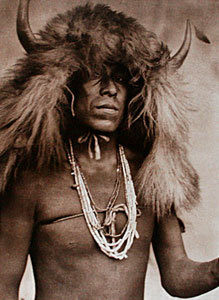 Edward Sheriff Curtis, Ring Thunder - Brule', Framed Photogravure, circa 1907, 7.25" x 5.25"
Shortly after the divorce, Curtis moved to Los Angeles where he took photo assignments and eventually opened a new studio with Beth. He also worked for Hollywood film studios taking publicity stills and working as an assistant cameraman on films such as The Ten Commandments. In a better financial position, he resumed his field work, but could not afford the publication costs for new volumes. J.P. Morgan had died in 1913 but, in 1922, Morgan's son stepped in to bring the remaining volumes to press because subscribers had been complaining to the Morgan bank about the long publication hiatus. It took almost nine years to finish the project with the final two volumes completed in 1930. In all, the Morgans contributed about $400,000. Estimates of the total project costs range from $500,000 to $1,500,000. Edward Sheriff Curtis, Shuati - Sia, Photogravure, 22" x 18"
The scope of The North American Indian was unequaled by any other documentary effort up to that time. In more than 22 years of work Curtis and his assistants visited and interviewed members of more than 80 tribes, took more than 40,000 photographs, made thousands of pages of notes and interview transcripts, and recorded more than 10,000 wax cylinders with Native music and languages. Along the way, Curtis also produced a movie, Land of the Headhunters, about Indians of the Northwest Coast. Edward Sheriff Curtis, Sia Buffalo Mask, Framed Photogravure, 22" x 18"
Despite this monumental accomplishment, The North American Indian did not receive the attention and acclaim its creators had anticipated. At $3000, very few individuals could afford the set. Moreover, the surge of interest in Native Americans that characterized the turn of the century was on the wane by the time the series was half complete. Even professional anthropologists were wary of the project because Curtis had no academic background (he had only six years of formal schooling) and because the photographs were artistically staged to varying degrees. As an ethnologist, Curtis considered himself a scientist, but working in the pictorialist photographic tradition, he also considered himself an artist. The combination did not prove to be popular. Although Curtis had anticipated printing 500 sets of The North American Indian, only about 280 were sold. Edward Sheriff Curtis, Timu - Cochiti, Photogravure, 22" x 18"
In 1935, the Morgan estate, which owned rights to The North American Indian, sold it to the Boston rare book dealer, Charles E. Lauriat Company, for $1000 plus a percentage of future sales. Lauriat received 19 completed sets of volumes and portfolios, thousands of individual photogravures, unbound pages of text, and the original copper printing plates. The original glass-plate negatives were stored in the basement of the Morgan library and were destroyed or dispersed during the 1940s. Curtis, who still owned the rights to his movie, eventually sold Land of the Headhunters to the American Museum of Natural History for $1500 although it had cost him about $20,000 to make. Edward Sheriff Curtis, A Paguate Entrance, Framed Tissue Photogravure, circa 1925, 16" x 12"
By the time Edward Curtis died in 1952, The North American Indian had been all but forgotten. Curtis did receive a short obituary in the New York Times which recognized his life-time devotion to documenting American Indians and noted his affiliation with Morgan and Roosevelt, but the piece concluded: "Mr. Curtis was also widely known as a photographer." Around 1970 a photographer from Santa Fe, Karl Kernberger, and two partners purchased all of the surviving Curtis material owned by the Lauriat Company. Since then the printing plates have changed hands two more times, staying in Santa Fe. 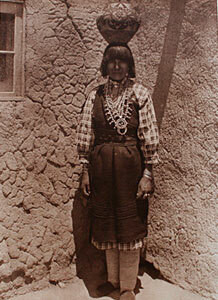 Efforts by all the later owners to publicize Curtis' work sparked fresh interest in The North American Indian. Over the past four decades, many Curtis biographies and compilations of images have been published, and restrikes from the original plates are still being sold. 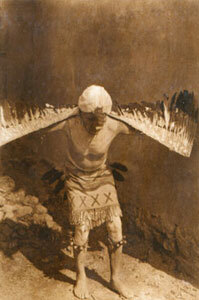 Edward Sheriff Curtis, Eagle Dancer San Ildefonso, Photogravure, 7" x 5"